The demand for seperate flag made by Karunanidhi was vehemently opposed by the then chief minister of Mysore, Veerendra Patil. CHENNAI: Karnataka government’s recent proposal to have a separate flag for the State did not trigger much discussion in Tamil Nadu. Ironic, considering the State was among the first to raise such a demand nearly five decades ago. In 1970, when the Dravida Munnetra Kazhagam (DMK) experienced its heady days after having captured power from the Congress, the then Chief Minister M Karunanidhi, who rose to prominence in the Dravidian movement that had once advocated separatism, wanted a separate flag for the newly christened State, Tamil Nadu. But that was not the first demand for a separate flag in the country. Jaipal Singh Munda from Jharkhand was the first to raise the issue, demanding one for the tribes and put forth his case before the Constituent Assembly. Similar voices were heard in Jammu and Kashmir, too. When he met the press in Delhi on August 27, 1970, Karunanidhi, the leader of DMK after the death of party founder C N Annadurai, even had a design ready: the proposed Tamil Nadu flag had the Indian flag in one-quarter, while the main space featured the State emblem, a temple gopuram as a symbol of Tamil culture. Significantly, the then chief minister of Mysore (it was renamed Karnataka in 1973), Veerendra Patil, vehemently opposed the demand. He said the Centre should have straightaway rejected the demand instead of consulting the chief ministers. His counterparts in Rajasthan and Orissa, Mohanlal Sukhadia and R N Singh Deo, and the then Jan Sangh leader A B Vajpayee, too, strongly opposed this move. In Tamil Nadu, the TNCC (New) and Congress (O) opposed it. They argued that to have a separate flag for the State would amount to changing the present national flag as the national symbol. It would lead to the disintegration of the country, they feared. However, the Tamil Arasu Kazhagam led by Ma Po Sivagnanam welcomed the demand for a separate flag for the State but suggested incorporating the symbols of three kingdoms that existed in the past — bow, tiger and fish belonging to Cheras, Cholas and Pandiyas, respectively. Meanwhile, Tenneti Viswanathan, MP from Andhra Pradesh, suggested that every State could be permitted to have its own symbol or standard inscribed in an area of one-eighth of the total area of the national flag, on its left-hand corner. He suggested this in a letter to Indira Gandhi. “This suggestion was the reverse of what the Tamil Nadu chief minister had suggested,” he said, and added that if it were accepted, the national flag and Ashok Chakra inscribed in it would be predominantly in the flag throughout the country and at the same time each State could have its own identity. 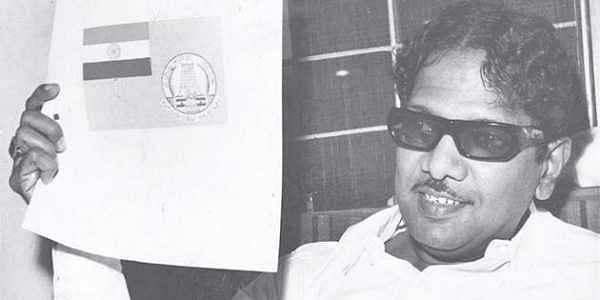 Karunanidhi recalled that the State government had addressed the Centre in June (1970) seeking approval for the model flag they had proposed as they wanted to include the Indian national flag in it. Karunanidhi pointed out that in Switzerland, all 25 cantons had their own flags; some of them had a population of less than 25,000. Karunanidhi further said he could not understand how the demand would lead to a civil war. He said it was not a forerunner of a separate Tamil Nadu demand and recalled even Indira Gandhi had said the demand did not indicate separatism. DMK leader K S Radhakrishnan said when the issue came up for discussion in Rajya Sabha on August 20, 1970, Indira said the entire question of the use of separate standards by the Union President, Governors and Army regiments would be looked into. While some of the members reiterated that the demand should have been rejected straight away, Indira said there was no question about the supremacy of the national flag. The suggestion was for a separate flag in which the emblem of the State could be fitted. She also welcomed the suggestion of NR Muniswami of Congress (O) that the matter should be referred to the National Integration Council. She also said in the United States of America and in Switzerland, each State had a flag of its own. When asked why there was a delay in replying to Tamil Nadu chief minister even after three months of receiving the demand, Indira said in India there were different parties in power in the State and there was a delicate Centre-State relationship. Meanwhile, S D Misra, general secretary of Congress (O) charged that Indira was adopting the policy of fulfilling the wishes of the DMK just for her own survival at the Centre. Karunanidhi said the State could not be prevented from having a separate flag either legally or constitutionally. On August 25, 1970, Karunanidhi met Indira at Delhi and said he was firm on his demand for a separate flag. In this connection, he recalled Rajaji’s view that the national flag resembled the flag of the Congress and should be changed. This momentum, however, was inexplicably lost before long. The discussion reached nowhere, and Karunanidhi’s suggestion remained only on paper. There has not been a clear explanation as to why he backed out from the proposal for which he had even readied the design. Interestingly, in 1974, just four years after he triggered the flag debate, Karunanidhi won the right for chief ministers to hoist the national flag on Independence Day. None asked about the Tamil Nadu flag.